Dundee’s city centre has been transformed into a unique pedestrian experience. 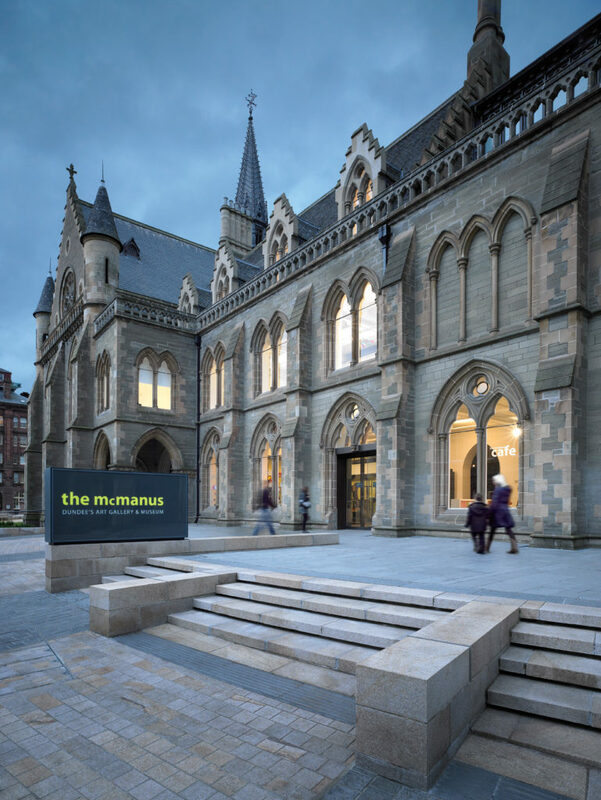 Historic and contemporary settings are blended together into a rich experiential tapestry, culminating in the project to restore what is now called ‘The McManus’ (originally The Albert Institute) and its previously, ill-considered setting. A new decorated vesica pisces landscape evolved in harmony with the Gothic spirit of the original building by George Gilbert Scott, and focuses on the Art Gallery and Museum. A new south entrance facing the city centre enhances access to and appreciation of the building and its collections. 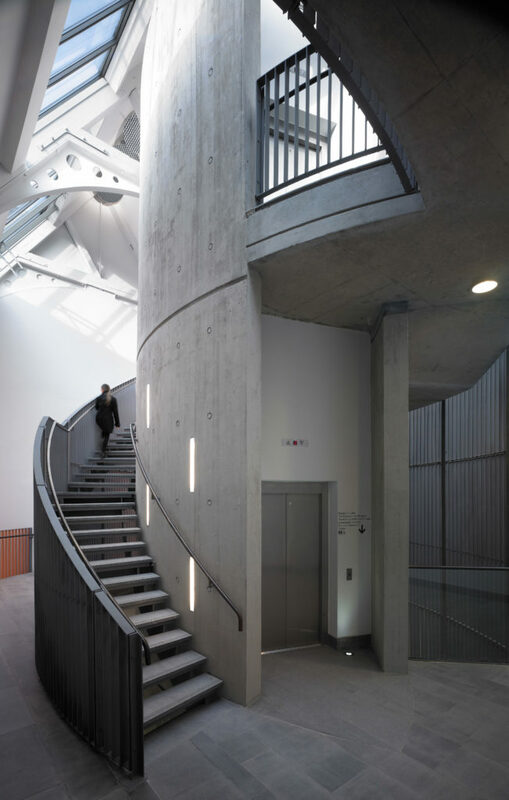 Internally, a new stair developed from the same geometry negotiates the various gallery levels of the building – a unifying circulation device for the restored collection of galleries representing the various eras of redevelopment of the building. 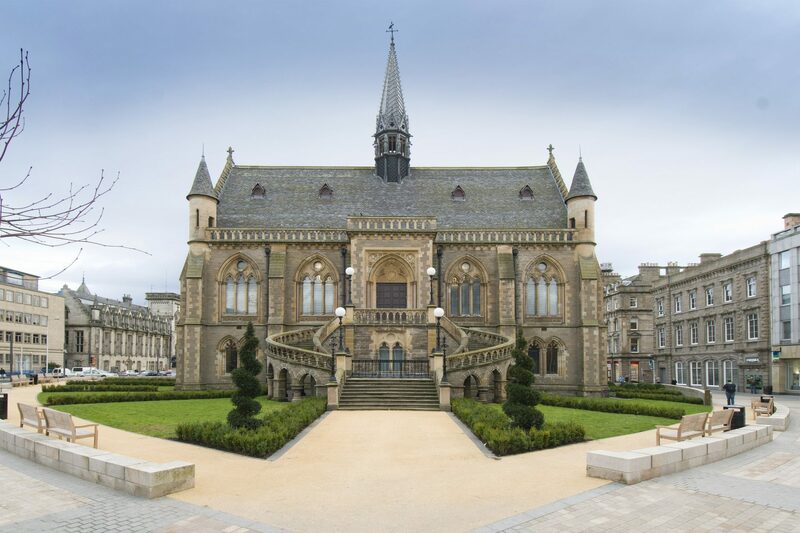 Page Park are responsible for the conservation, repair and adaptation of this Category ‘A’ Listed building. 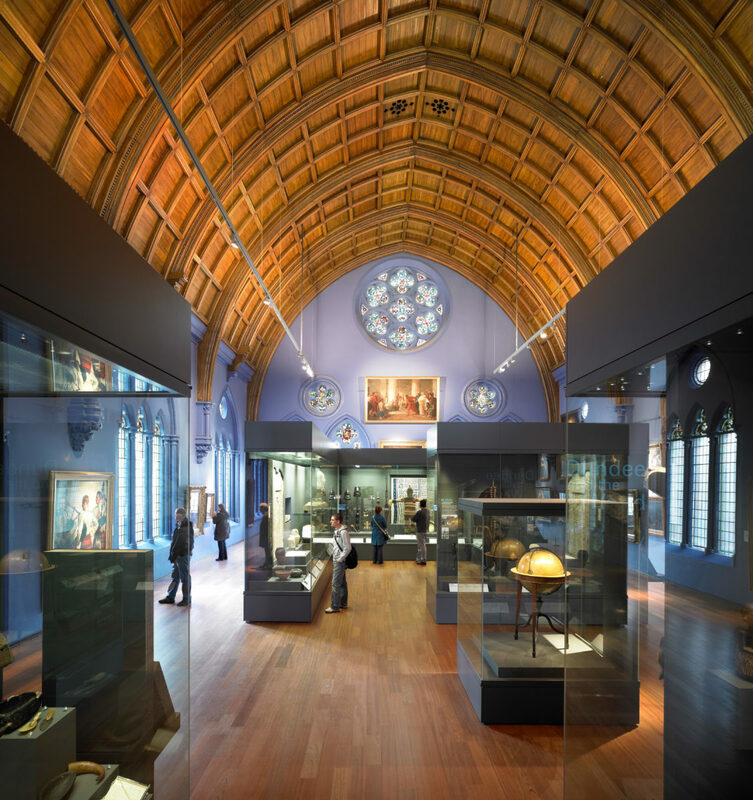 Access by the public at all levels was a key element of the project and by re-arranging support and access functions, prominence and dignity has been restored to the original rooms. 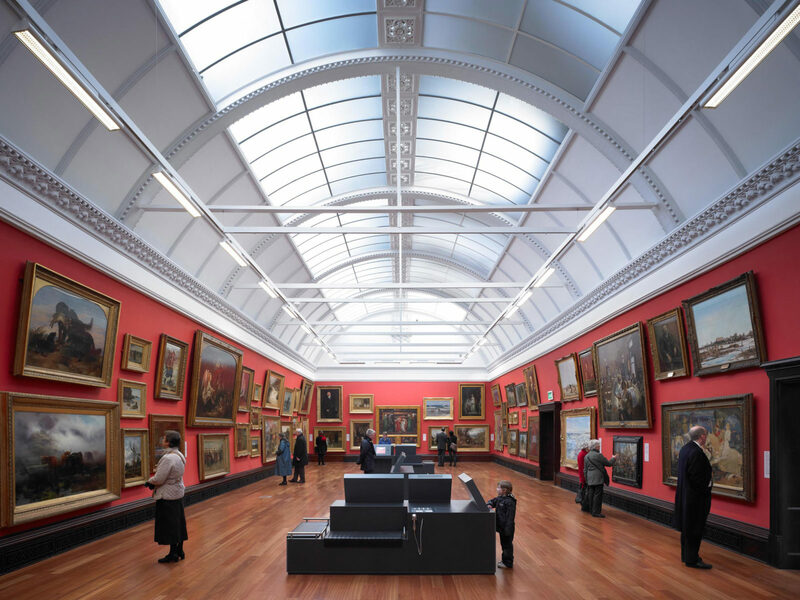 The work at McManus Galleries has removed clutter and made the building organisation clearer, better serviced and more accessible. The project includes a new entrance on the south elevation, creating a new arrival point at the heart of the building. A new circulation core with stairs and lift connects all levels of the building. 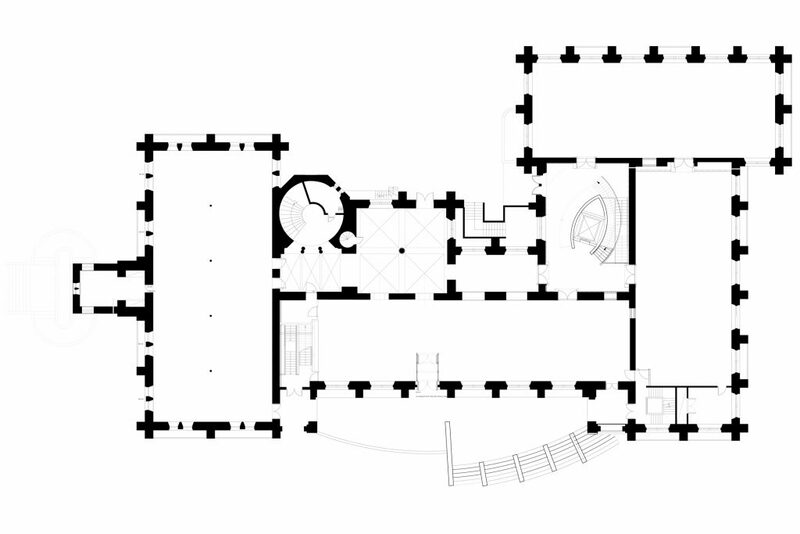 The resulting sculptural form echoes that of Gilbert Scott’s circular stair adjacent to the north entrance and the sweeping external stone stair on the west façade. Taking cues from the circular setting of the classical High School building adjacent, the building is inscribed by a gothic vesica shape creating a series of gardens and paved terraces around the building. A key element of this project was the creation of a new south facing entrance addressing the approach from the city centre. 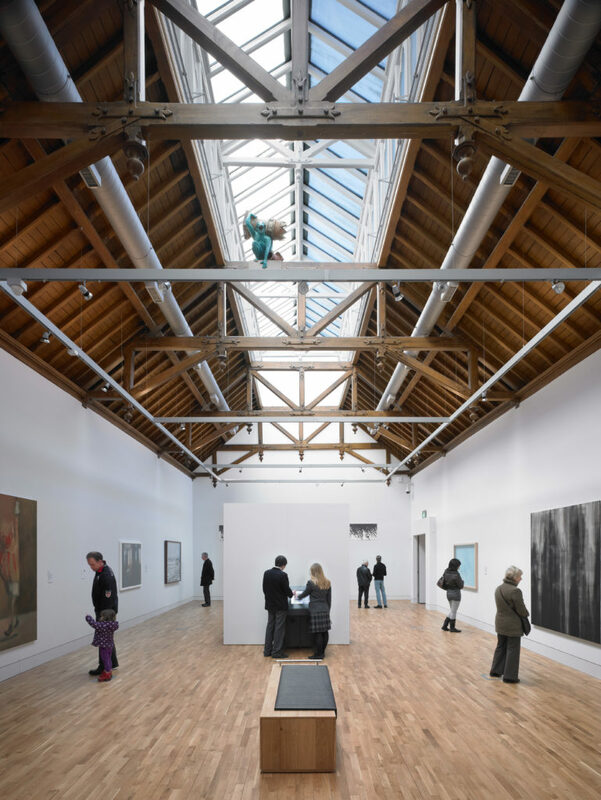 With a generous external terrace leading from the café, and a shop and reception immediately visible on entry, the internal organisation of the galleries seeks to break down the threshold and welcome an increasing number of visitors. 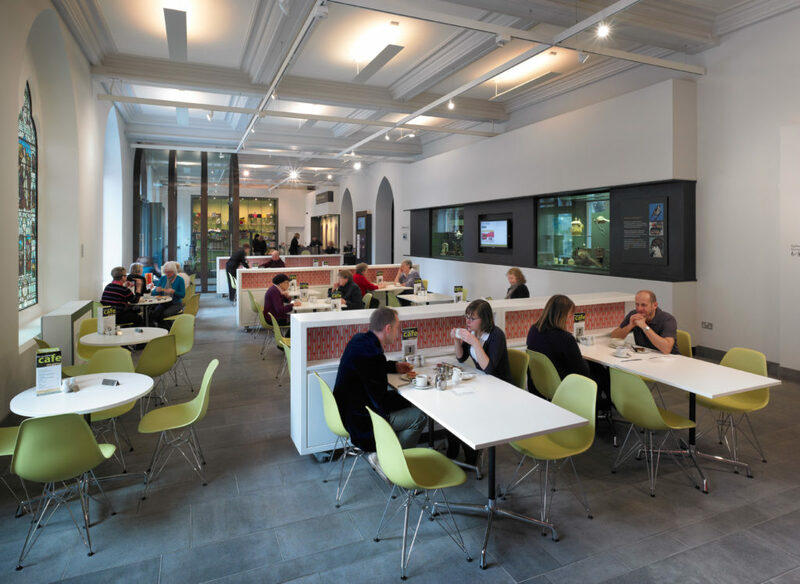 Strategically positioned display cabinets allow the visitor early engagement with the wider collection whilst using the café as a way of enticing visitors to explore further. 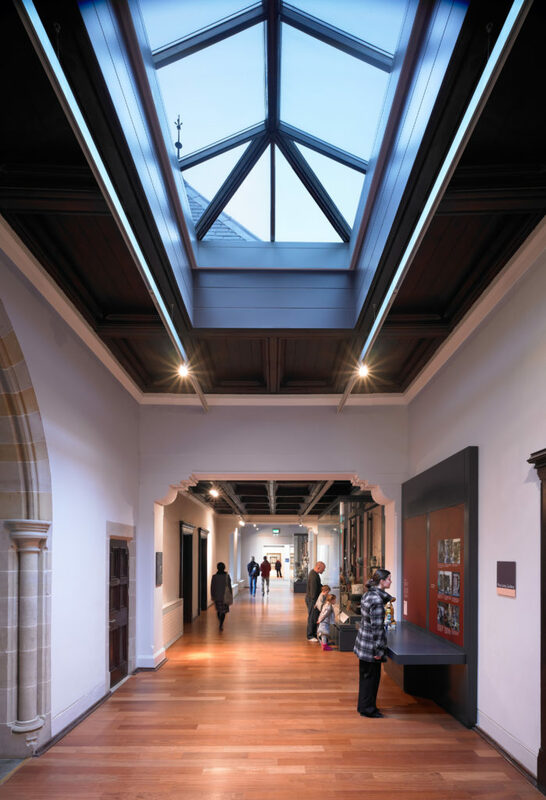 Physical access to the upper galleries is improved by the insertion of the new contemporary stair and lift, drawing inspiration from the Gothic geometry, and providing a natural visitor journey that flows easily through all of the gallery spaces. The strong vista to the High School from Reform Street reveals a classical building in a circular setting, whereas the existing buildings around the perimeter of Albert Square create an informal enclosure around McManus Galleries. Inscribing the building with a vesica piscis – the geometric construction that generates the gothic arch – provides a dynamic setting for the George Gilbert Scott’s gothic building. The collected assembly of historic buildings around the square doesn’t make a pure geometric space – rather it makes a space where ‘purer’ forms can be expressed. 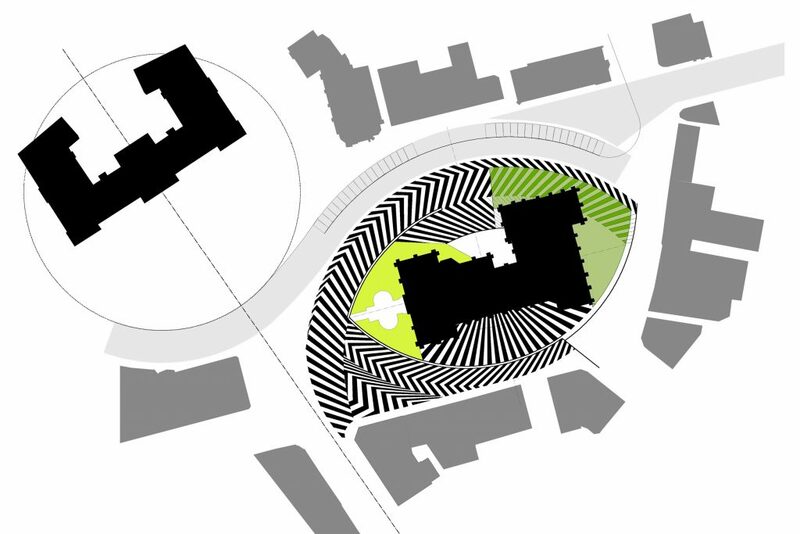 Overlaying the vesica piscis on the streetscape surrounding the galleries creates a clearly defined garden oasis for each façade of the building. Tracing a wider arc outside the original form creates more space at the north-east corner of the galleries and draws attention to the main gallery entrance on the northern facade. Unravelling the vesica piscis in a spiral form creates a curving path, extending Reform Street beyond the vista of the high school in a grand sweep to the gallery entrance. 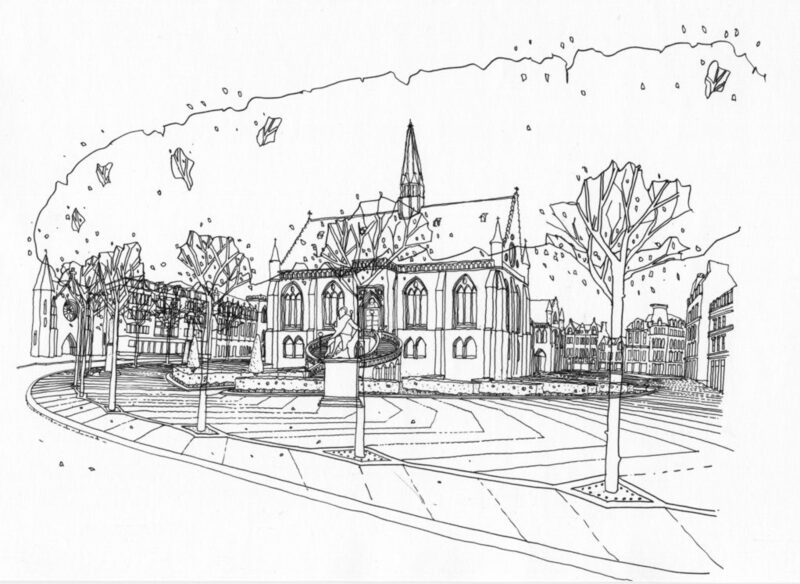 The sweeping path is reinforced with a curving shield of trees and punctuated with existing and relocated statues of historic figures. The spiralling vesica shape becomes a platform on which the McManus Galleries sit. The radiating lines of the paving pattern both extend the gallery out into the urban space and draw people in from the commercial centre of the town.